Self-described democratic socialist Alexandria Ocasio-Cortez campaigned on behalf of five Democratic candidates prior to their respective primary elections this week, and only two candidates won on Tuesday night. Ocasio-Cortez, who upset Rep. Joe Crowley (D., N.Y.) in the Democratic primary for New York's 14th Congressional District in June, recently traveled throughout the Midwest with Sen. Bernie Sanders (I. Vt.) to campaign for state and congressional candidates looking to take back control of the House for Democrats. She traveled to Michigan last week to campaign for Abdul El-Sayed, a Democratic candidate who was vying to be the first Muslim governor in the United States. "I will not listen when folks say it is not possible in the Midwest again. We would not be packing high school auditoriums in Grand Rapids unless there was an audience and unless you were fighting for this issue with us," Ocasio-Cortez said at a rally supporting El-Sayed. "We can change this state, no matter the odds, and we can change this country, no matter the odds." El-Sayed lost his Democratic primary by approximately 20 percentage points to Gretchen Whitmer, a former Democratic leader in the state legislature. Ocasio-Cortez also supported the candidacies of Cori Bush, a Democratic candidate in Missouri's 1st Congressional District, and Fayrouz Saad, a Muslim Democratic candidate in Michigan's 11th. Both candidates lost their races, despite Ocasio-Cortez endorsing them and campaigning in their districts. Bush lost her primary by 20 percentage points and Saad lost her primary by about 8 percentage points, with 99 percent of votes counted. "[This] isn’t the year that we get our first Muslim woman to Congress — it’s the year that we get our first class of Muslim women," Ocasio-Cortez said in Dearborn, Michigan, referring to Saad. The National Republican Congressional Committee suggested Ocasio-Cortez's endorsements may help the Republican Party more than her own. "If she keeps this up, we may have to start reporting her involvement in the midterms as an in-kind contribution to the Republican Party," said NRCC spokesman Chris Martin. Ocasio-Cortez's endorsement victories occurred in Democratic primaries in Michigan and Kansas. The two successful candidates she endorsed were Rashida Tlaib, a Muslim female candidate in Michigan's 13th District and James Thompson, an infantry Army veteran in Kansas' 4th District. She campaigned for Thompson last month in Wichita, Kansas and talked about the importance of "swing[ing] this district blue." Initially, she reached out to the candidate to make sure he was comfortable with her campaigning in his district given her support for abolishing U.S. Immigration and Customs Enforcement and her association with socialism. "They’re going to call me a socialist anyway," Thompson said he told Ocasio-Cortez. "You might as well come out so we can all have a good time." Ocasio-Cortez never tweeted support for Tlaib until after she won her primary, but she did attend a Muslim get-out-the-vote rally supporting the Michigan Democrat's candidacy. 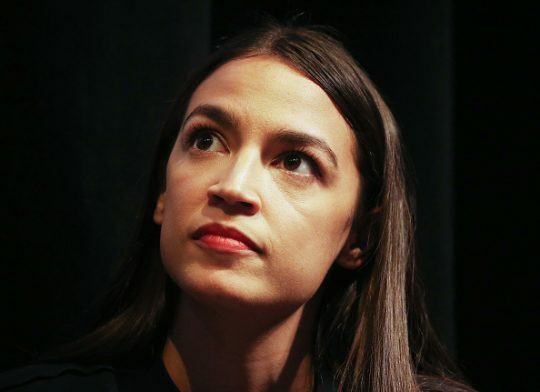 Ocasio-Cortez, who Democratic National Committee chairman Tom Perez pronounced to be the "future" of the Democratic Party, supports several extreme policy positions in addition to abolishing ICE, including support for a federal jobs guarantee and a single-payer health care system. This entry was posted in Politics and tagged 2018 Election, Alexandria Ocasio-Cortez, Kansas, Michigan, Missouri. Bookmark the permalink.